Power Equipment Forum : Power Equipment Forums > Power Equipment Forum > Generator Forum > Can sun set petrol on fire? Can the sun set petrol on fire? I have just got my first portable generator and Im storing it just outside my house connected up with a weatherproof cover on, so its just ready to go in a powercut. But during the summer months it will have the full sun shining on it and the max temp here in the United Kingdom UK is about 30c in the summer months.. My idea was to store it with at least half a tank of petrol (about 5letres), but is that a bad idea? Last edited by speedy2019; 02-23-2019 at 10:30 AM. 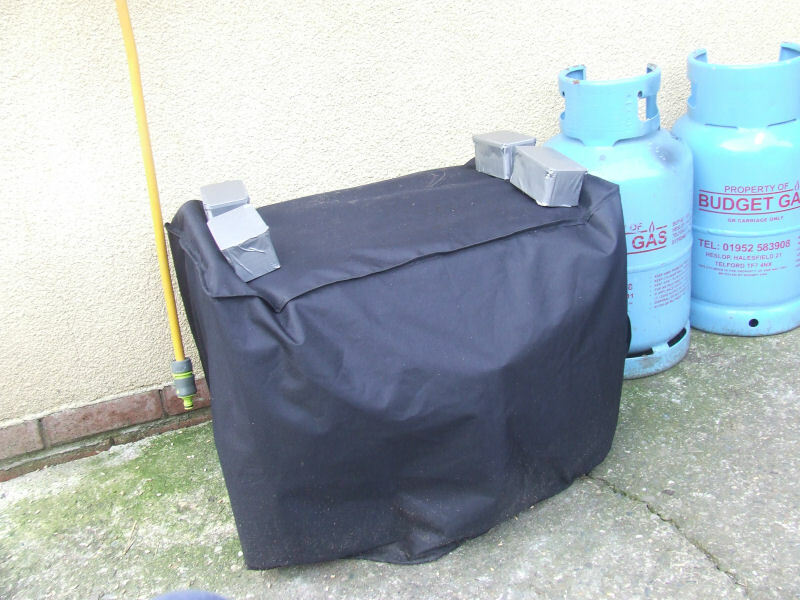 Have your cover propped up away from the generator so it's covered, but "in the shade" with air circulation. Should be fine. The cover is just flat on the generator with weights ontop. But I could put the weights underneath the cover though, then breeze can then circulate up and under the cover, thats if its not too windy. In the mornings I dont think the sun shines much in that area or its not that strong in the mornings, but will have the full sun shining on it in the afternoon and its south facing too. I have just googled and petrol doesn't ignite until it gets to about 250c, so if the actual outside air temp is a a max of 30c, surely the sun temp cant be much more then 50c, can it? I might buy one of those propped up tent/cover things as Im guessing I cant use the generator with the cover on, even though one of the side flips up for the exhaust? Or I might bang together 2 sides and a top out of ply wood to protect it from the rain, when its in use. Edit: I could even secure a weatherproof sheet to the wall of the house and drap it over the front of the generator, so its sloping over the generator with weight holding the cover tight to the floor.. The air then can flow through the sides of the generator and it will be sort of protected from the sun and rain..... Ideas, ideas. Last edited by speedy2019; 02-23-2019 at 05:21 PM. It's unlikely that the fuel will ignite, but if the tank keeps getting very hot, the volatile components of the fuel will boil off and exit via the tank vent, leaving you with less effective/energetic petrol. It has an initial boiling point at atmospheric pressure of about 35 °C (95 °F) I'm suggesting attaching your cover to a frame (perhaps made of PVC tubing?) to provide cover while allowing air to circulate. Your Edit in your last post sounds like a winner. No danger of the fuel igniting, but there's another issue you need to think about. Leaving a fuel tank outside half filled for months is a bad idea. Gasoline, or petrol, doesn't store well, and if stored too long, can deteriorate into gunk that will clog up your fuel system. Moisture can condense on the interior surfaces of the fuel tank and drip into the fuel, accelerating this deterioration. Additives can help, but you're still taking a chance on this happening. Last edited by motormonkey; 02-23-2019 at 09:43 PM. Yeah I have heard about the moisture getting in the tank, some people fill the tank up right to the top to aviod this. Im hoping with keeping the cover on the generator it will stop the moisture getting to the tank? At the moment theres not much in the tank at all, but a few days ago, I bought 4 letres, but do I put it all in, or just put in a small amount for the monthly runs? Edit: we have a mower and strimmer that never gets oil changes, tanks drained out for the winter and generally looked after, as they are not my tools and they keep going year after year. I am trying to take care of my generator as best as I can(being in a wheelchair doesnt help) and knowing my luck it wont work properly when the time comes to use it, but thats always the case isnt it. Last edited by speedy2019; 02-24-2019 at 03:46 PM. I haven't had machinery with a metal tank, mine are all plastic. But I've heard people suggest leaving metal tanks full to try and reduce condensation & rusting in the tank. The closest thing I have to your setup is my lawn tractor, which is under a tarp, outside. Plastic tank, though. I keep stabilizer in my gas year-round (even when I fill the can in the middle of the season), I consider it cheap insurance. I'd add an appropriate amount to what's already in the tank (or treat the new gas, then add that, and run the engine long enough to draw the stabilized gas into the carb). Running the engine is good, but just doing that won't really keep the gas fresh. I'd add stabilizer to your gas, whatever you decide to do. It's a good way to help reduce the risk of problems. One option (if you have a petrol-powered car) is to siphon the fuel out of the generator's tank, and put it into the car, every few months. That's one way to change out the supply. Or just keep a small amount in the tank, and the rest (stabilized) in a gas can. That way it's easy to just add what you need, or dump that into the car every few months, to put fresh gas in the tank. Running it periodically will help you keep an eye on the engine's condition, and avoid suddenly discovering there's a problem when you actually need it. When you run it, I'd add a decent load, like maybe the 2000W kettle or something, to let the engine actually work. Then disconnect the load, close the fuel shutoff, and let the engine run until it dies. Well I have poured that 4.5litres of petrol in the generator and it says its quarter full, so that will last about 4-5hrs, about a litre a hr and that's roughly £1 per hour if the specs are true. Now to buy some stabilizer as that petrol may sit in there 1-2 years if we dont get much bad weather....But the weather is sooo unpredictable nowadays that you have no idea what its going todo next,,, apparently strong winds tonight and tomorrow. My petrol funnel I 3d printed out works perfectly, it sits in nice and straight without having to hold it and the petrol can be poured in nice and fast without splattering the generator. I was amazed to see a petrol filter sitting in the fuel tank when removing the cap, something I wouldn't expect with a cheap Honda clone generator. Last edited by speedy2019; 03-02-2019 at 06:37 PM. If the fuel is going to sit for 1-2 years, I'd start being concerned about it degrading, even with stabilizer. At least make sure you're running the carburetor dry after each use. My preference would be to burn the stabilized fuel within a year. It's a generator, it needs to work when you need it. It's not like a mower, where you can just wait and cut the grass next week, if there's a problem. If you have other petrol-powered equipment (even if not the car), I'd siphon out the tank and use the it in those, rather than letting it sit in the generator for 2 years. I am hoping that we will have a powercut long before then,, Im just saying it could be sitting there for 1+years, but who knows. Its going to be used monthly for 15-20 mins anyhow. I have just bought this,, so it will have its monthly run when I put it in. It says it improves the starting of engines, but I guess thats only if the carb is gummed up, hopefully mine is still clean. Last edited by speedy2019; 03-03-2019 at 11:03 AM.